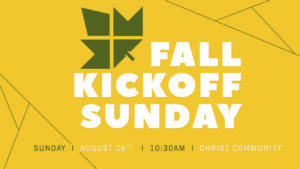 Our Fall Kick-Off Sunday will be on August 26. School will be back in session and Summer travel should be over! It’s time for everyone to re-engage at Christ Community! Rally your small group, your ministry volunteers, and your neighbors and join together for this exciting Fall Kick-Off Sunday! 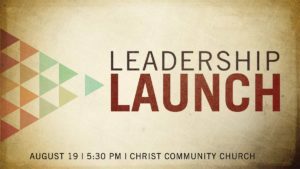 Leadership Launch is August 19th at 5:30 p.m.
We are working hard to get ready for the Fall season here at Christ Community. Our team is focused on each one of our ministries and we’re praying diligently for the Lord to bless in every way. As we prepare for our ministries, it’s vital that we help equip you for ministry! This is the reason we annually host Leadership Launch. Leadership Launch is our volunteer rally for all current volunteers and all of those who have interest in serving at Christ Community. You do not have to be a member or a current volunteer to attend Leadership Launch. We will provide dinner and childcare, we’ll have some fun together, and I will be sharing from my heart on a few important topics relating to my own personal focus for this next year. We will also be doing something a little different this year as it relates to how we are going to specifically invest in you! You will not want to miss Leadership Launch. You can follow this link to register. Individually:Honor the Lord with at least the first tenth of all God has entrusted to you, and do so wherever you are located geographically. Together:When we reach the individual goal, we will reach our Summer Giving Challenge goal of $437,400 over these 15 weeks of the Summer season beginning Memorial Day Sunday through Labor Day Sunday. Make Up:When we re-engage, we make up our giving for the Sundays we have missed, unless we have been giving through recurring giving or another way while we were away. Regardless, it is our goal to make up if any Sundays are missed. Why is this important? Why do I spend time talking about this with you personally? It’s not about reaching a goal, but it is about being all God desires for us to be and living according to his plan for our lives. It’s not about Christ Community Church, but about your life, your personal walk with Jesus, and your faithfulness to the Scriptures. Thank you for all you have done and now, lets get this done together! 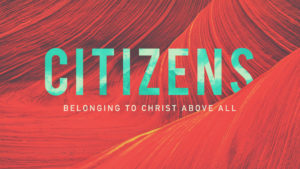 Two sermons remain in our Summer sermon series, Citizens. This week will be a different Sunday. It will be unique. 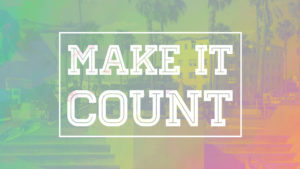 It will be distinct. It will be special. The focus of our time together will be “Worshipping Together” and you will be blessed. I will be preaching on what it means to worship Jesus together as the Church. How what we do in our time together on Sunday mornings is to be a blessing to God and a blessing to one another. You won’t want to miss this memorable service. Please, pray for us as we get ready for the Fall. Pray for me as I seek God’s will for our future, and as I seek to lead forward in boldness and truth. I rejoice with you Christ Community in all God is doing among us. Thanks for being a great church!